This high-end Laguiole knife has been crafted by hand, its handle receives a forged spring with a chiseled Breton triskel. 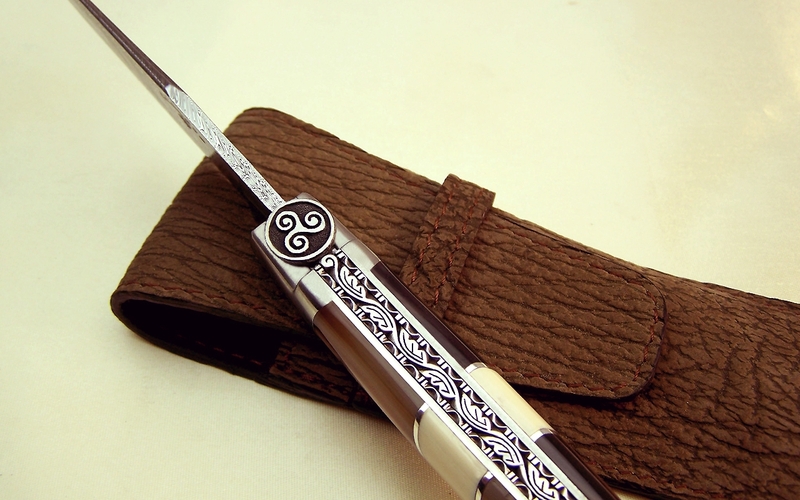 Robust and elegant at the same time with these double plates decorated with a guilloche on the top and its handle in point of natural horn with a partition in solid silver 925 and a insert in heart of ivory of mammoth fossil. The triskel is a Celtic symbol considered an important feature of Celtic art at the time of the Tene Triskel is used in Greek antiquity. From Agathocles of Syracuse, he appears on the coins in Sicily, a three-caped island, of which he becomes the symbol. The triskel has also been taken over and integrated into the architecture of many abbeys, convents and churches. The triskeles, which means "three legs," is a symbol representing three human legs, or three intersecting spirals, or any other symbol with three protuberances evoking cyclic group symmetry. His oldest representations have been found on the megalithic temples of Malta. In the years 1914, the triskell was rediscovered in Brittany. It was notably used in nationalist journals, then adopted by the Breton National Party which made it its insignia in 1940. In the 1970s, the revival of Celtic music and the success of artists like Alan Stivell helped to make This pattern is known in Brittany and throughout France Today, triskel is strongly associated with the Breton culture and the tourist promotion of this region. 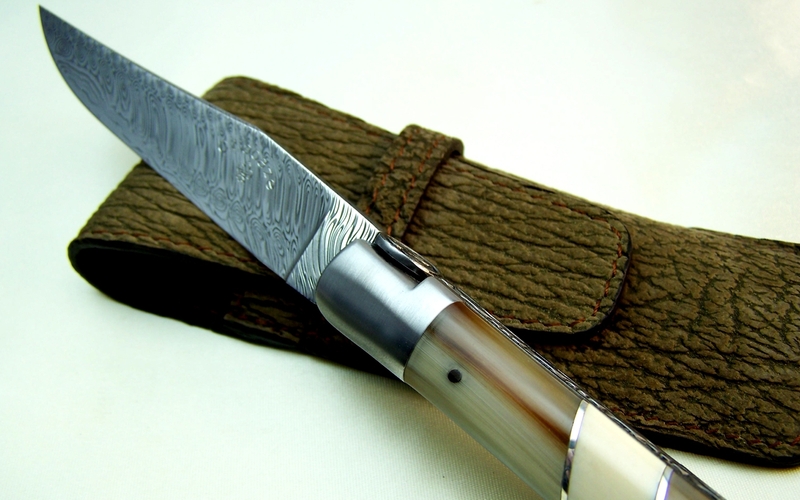 This knife is made in my workshop and signed LACAZE to guarantee a quality know-how. 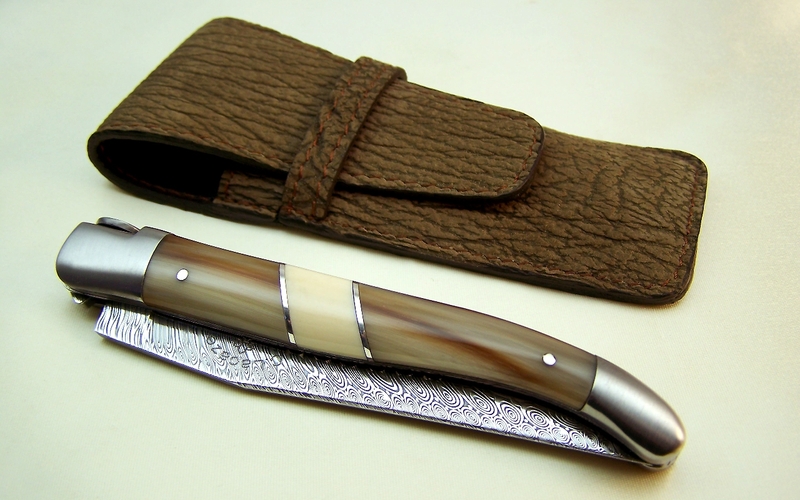 Natural horn with 925 solid silver partition and mammoth ivory fossil, triple plates with central chiseled.﻿.